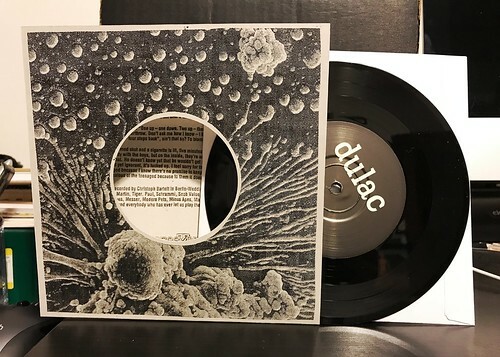 I Buy Way Too Many Records Dot Com: Dulac - Must Be You 7"
A few years ago, Dulac put out a fantastic record called The First of the Last Chords. It was a hit and I've been waiting to hear more from them. Oddly enough it ended up being an older 7" of theirs that I didn't know existed that recently came across my radar. Released in 2013, this four song 7" appears to be the vinyl version of the band's first cassette release. If nothing it's a reminder of what a fierce and energetic band this is. Channelling bands like Red Dons or early Estranged, they have the fast and melodic downstroke wizardry down pat. But you really need to mix that with the pop sensibilities of a band like Statues to have a clearer picture of what Dulac brings to the table. Each of the 4 songs on this 7" are just perfect; they've fast, loud and catchy - just how I want my music to sound. A day or two after I bought this record, I stumbled across another newer Dulac 7" that had been released. That one has been ordered and is on its way to me as well. Look for that soon and hopefully the band is working up on a follow up full length. I know I will buy it immediately.